Each of your subscribers has access to a private portal to allow them, among other things, to change their credit card from which the payments are made. How does the private portal of your subscribers look like ? Your subscribers can view the details of their subscription and terminate them. 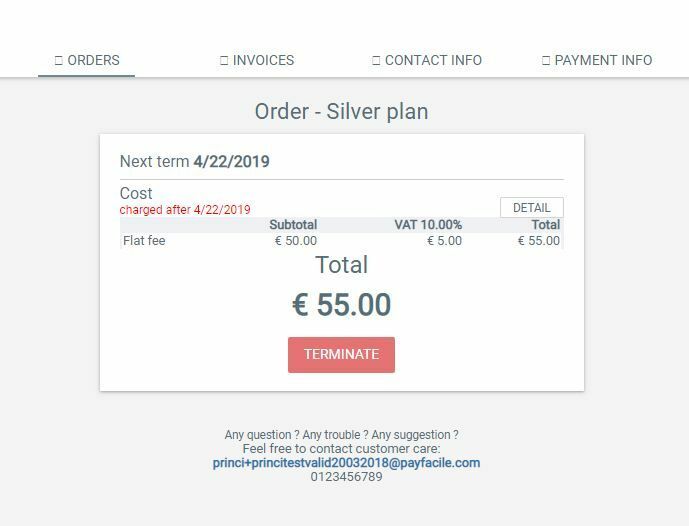 Your subscribers can download their invoices. Your subscribers can change their billing information. Your subscribers can change their payment method. Very useful in the case of credit card expiration for example. How do your subscribers access their private space ? When a customer subscribes to one of your subscription offers, he will receive an order confirmation email with a link to his private portal . All automatic emails sent to this customer will have a link to his private portal. How to hide the terminate button ? You can decide to hide the &apos;Terminate&apos; button on your subscribers&apos; portal to prevent them from terminating their subscriptions themselves. This article explains How to hide the &apos;Terminate&apos; button ?